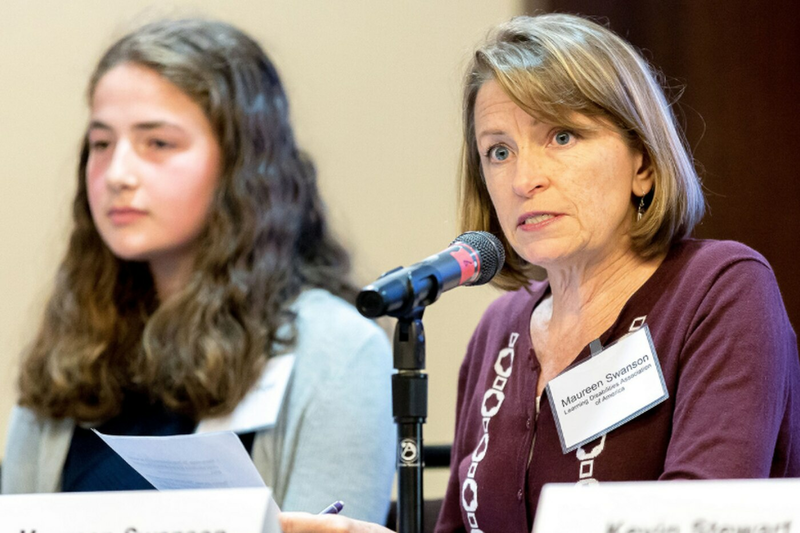 Maureen Swanson of the Learning Disabilities Association of America gives testimony at an EPA public hearing on its proposal to roll back clean car standards in Pittsburgh Sept. 26, 2018. Since becoming acting administrator of the Environmental Protection Agency last summer, Andrew Wheeler has taken unprecedented steps to dismantle rules adopted on a bipartisan basis to protect children’s and fetal health from pollution and toxic chemicals. Now the Senate is poised to vote on whether this former coal industry lobbyist becomes the official EPA administrator. On Monday, the Senate Environment and Public Works Committee voted to confirm Wheeler, and the vote will move to the full Senate. Wheeler’s attacks on the Clean Air Act include proposals to undo rules on mercury and carbon dioxide emissions. He has delayed or torpedoed proposed bans on a brain-damaging pesticide found on the fruits and veggies we feed our kids, and on two toxic paint-stripping chemicals that can cause miscarriage, learning problems, and death from fume inhalation. He continues to hinder implementation of the nation’s Toxic Substances Control Act, which Congress overhauled virtually unanimously in 2016. It authorized the EPA to assess and restrict chemicals found to be harmful to human health, with special precautions to protect the health of pregnant women and children. And despite public outcry, under Wheeler’s leadership, the EPA and National Highway Traffic Safety Administration finalized a proposal to halt clean car standards enacted in 2012 that increase fuel efficiency and reduce greenhouse gas emissions. Beginning in utero, children will suffer the most from these rollbacks, as their developing brains and bodies are particularly vulnerable to harm from even low levels of toxic chemicals and pollutants. The dirty car law is especially alarming for Pennsylvania families. According to the American Lung Association, five Pennsylvania counties — Allegheny, Lancaster, Delaware, Philadelphia, and Lebanon — are among the 25 counties nationwide most polluted year round by particulate matter, microscopic particles in the air that can penetrate deep into the lungs and blood stream. In these five counties, the health of approximately 4 million people is at risk year-round from air pollution. In addition to causing and exacerbating asthma, lung cancer, and heart disease, combustion-related air pollution puts children at increased risk for learning and developmental disorders, scientists and health experts — including the American College of Obstetricians and Gynecologists and National Medical Association — now agree. A growing body of research links traffic-related air pollution with decreased cognitive function and lasting problems with learning, memory, and attention. More than 25 peer-reviewed scientific studies, including studies by researchers at Drexel University and the University of Pittsburgh, find that prenatal and childhood exposures to air pollution can increase children’s risks for autism. The health risks don’t end there. Last fall, Wheeler proposed to gut the Mercury Rule, which since 2011 has effectively lowered mercury emissions from coal-fired power plants. Even tiny amounts of mercury can impair children’s brain development and function. Throughout Pennsylvania, state-issued advisories warn people — especially pregnant women — not to eat certain fish due to mercury levels. Wheeler is using the Mercury Rule as a test case to try to change the way EPA counts the health effects of pollution in establishing regulatory standards. His proposal would decrease the value we place on the human lives affected by toxic chemicals and pollution, and instead prioritize the cost to industry of having to comply with a regulation. If Wheeler wins on the Mercury Rule, there is nothing stopping the EPA from using the same deadly calculations in deciding whether to protect people from other toxic chemicals and pollution. There are zero benefits to having dirtier, less efficient cars. There are zero benefits from allowing coal plants to emit more brain-damaging mercury. As an advocate for children with learning and developmental disabilities, and as a parent, I hope the Senate will reject Wheeler’s nomination unless he reinstates commonsense rules to reduce air pollution and keep toxic chemicals out of our food, water, and products. It’s hard to believe that anyone, even a former coal lobbyist, would use his office to expose pregnant women and children to higher levels of harmful substances. But that is what’s happening. Pennsylvania families are relying on our senators to stop Wheeler from enacting measures that put children at grave risk of harm. Maureen Swanson is director of the Healthy Children Project and co-director of Project TENDR (Targeting Environmental Neuro-Development Risks) at the Learning Disabilities Association of America in Pittsburgh.